Music any way, shape and form. 1 Music any way, shape and form. 1.1 UNIT 15 DAY 1 - Architecture of Sound. 1.2 UNIT 15 DAY 2 - Harmony and Melody. 1.3 UNIT 15 DAY 3 - The Rondo. 1.4 UNIT 15 DAY 4 - The Canon. UNIT 15 DAY 1 - Architecture of Sound. ① Why can we compare Music with Architecture? 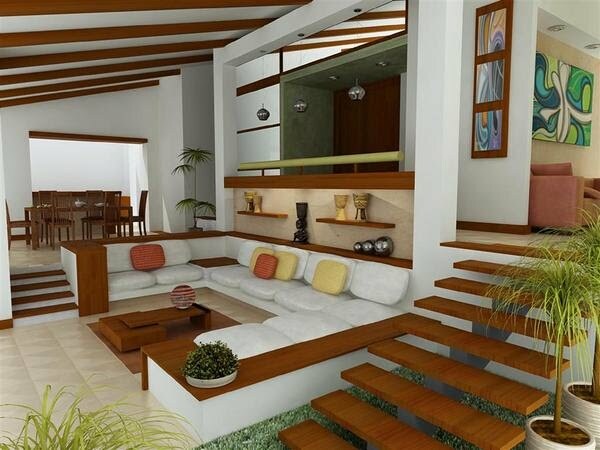 Because Architecture creates a space to live in and Music a time to live within. ② How a composer creates Harmony? By creating proportions, mainly in Pitch, and devising harmonious relations between the various elements of the composition. 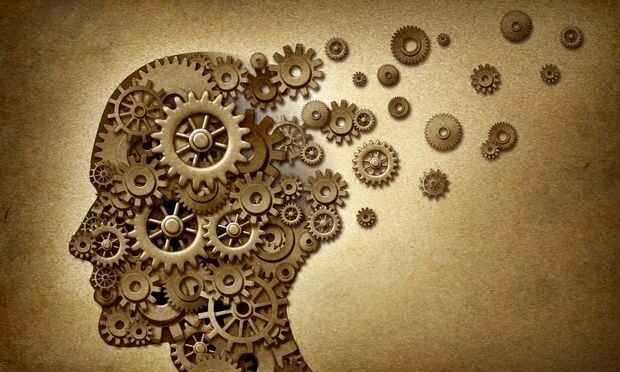 ③ Why is memory so important to appreciate Music? Because Music takes time to exist and we must remember what we are hearing. ④ How we name the different parts of a composition? With Squared Capital Letters in alphabetical order. 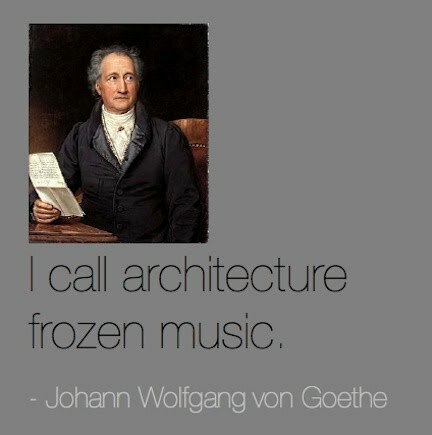 Music has an architectural structure. Nothing in it is arbitrary; the composer wanted that particular melody sounded in a particular moment, surrounded by other parts. The elements are in proportion and harmony, just like music elements. The different parts of a composition are named with the capital letters of the alphabet and within a square. Ascending Five note Chords with eleventh. UNIT 15 DAY 2 - Harmony and Melody. ① How a musical form is generated? Usually with several elements, especially with a chord progression and melody. ② What can we do to continue a main part? We can continue it by repeating, recording or contrasting it. A musical form is generated with various elements, especially with a chord progression and a melody. The Musical structure starts with harmony and melody. Form will appear in that game of composition and development. After a Main Part a composer has three options: repeat it, vary it or contrasting it with another part. Very similar to the options he or she has after the first note: repeat it, write a note of higher pitch or write a note of lower pitch. UNIT 15 DAY 3 - The Rondo. 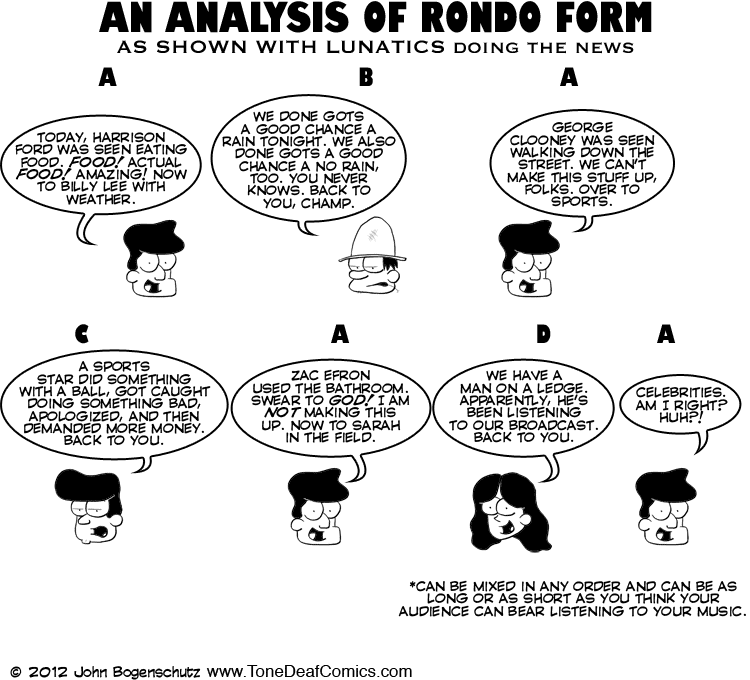 ① What is a Rondo? It's a composition that alternates contrasted episodes with a recognizable melody to which they oppose. 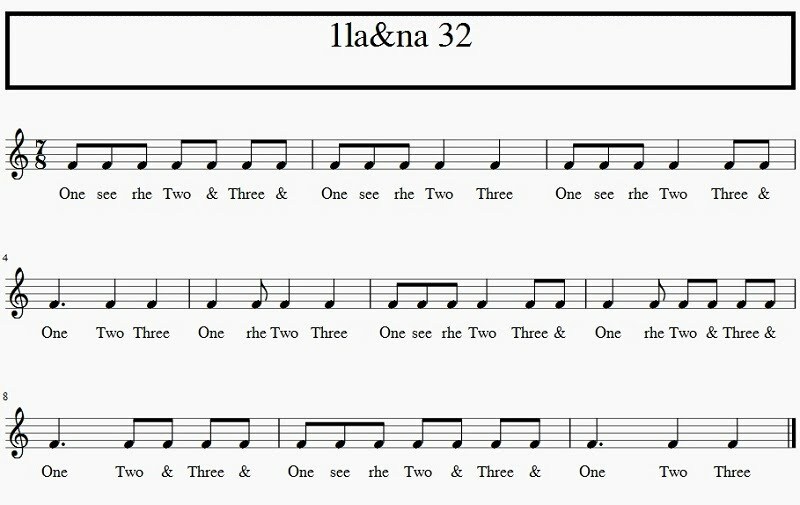 A Rondo is a Musical piece alternating episodes contrasted with a recognizable melody. 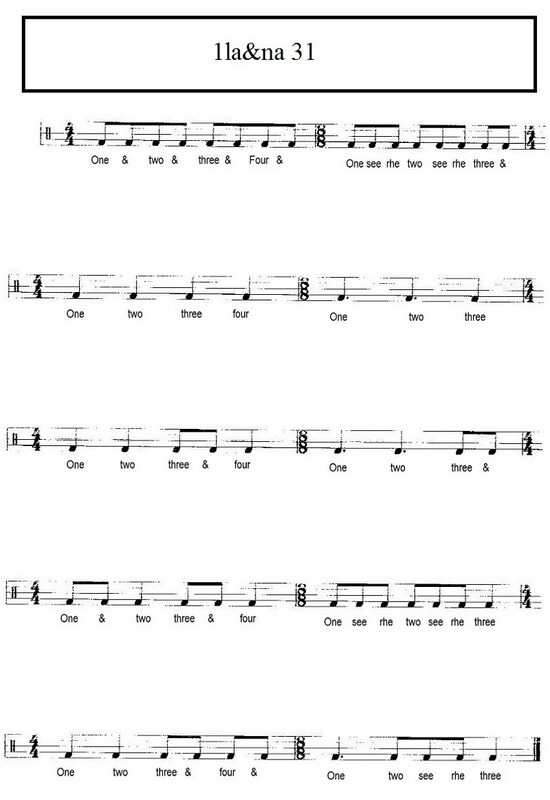 Based on the repeated part, varied or contrasted parts are written in a shuffled way. Ascending Five note Chords with thirteenth. UNIT 15 DAY 4 - The Canon. ① What is a Canon? It is a melody that is repeated without change, but has different entrances, which create Polyphony by accumulation. ② Why do we have to study Form in relation to the History of Music? Because Musical form are closely related to the ages and styles in which they were designed. Musical structures can be generated from a single melody line. 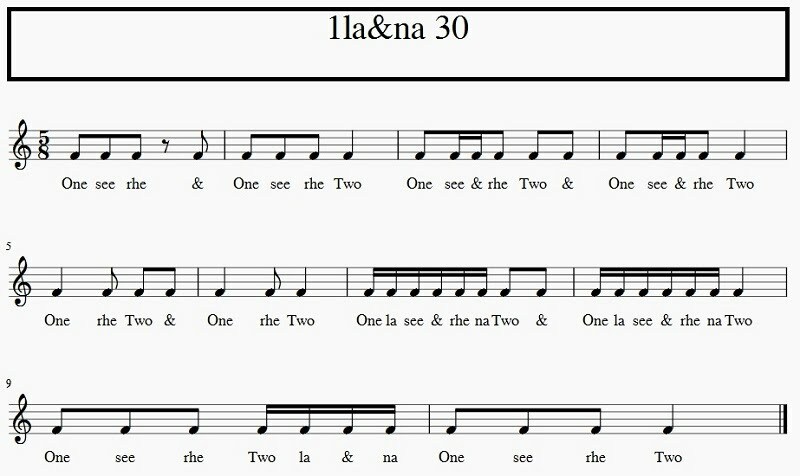 Although a chord is usually represented as a block of sound or as the notes played at the same time, Polyphony can also be achieved in other ways. A Canon is a melody that is repeated without change, but has different entrances, creating Polyphony by accumulation. Next year we will study some of the major forms like Fugue, Sonata, Lied, Scherzo and Variations, but as you can see the structure of a musical work can be very rich and varied. 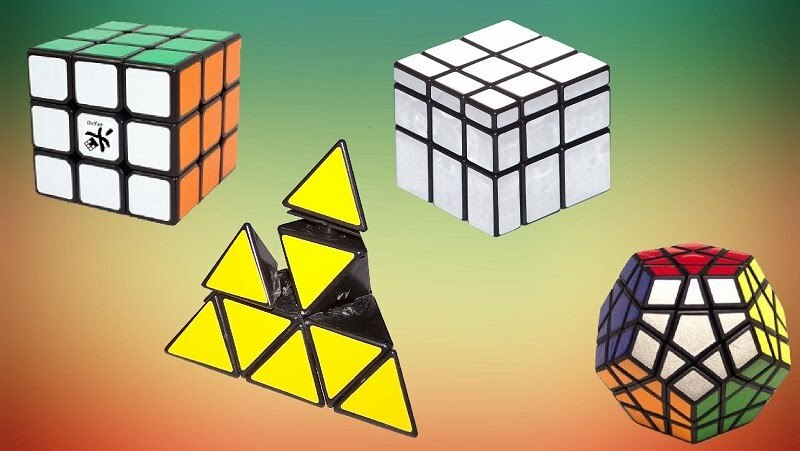 Some of these forms are so closely associated with the Music and the Musical Period in which they arise that they are almost inseparable from each other. For that reason we will study them in relation to the History of Music. 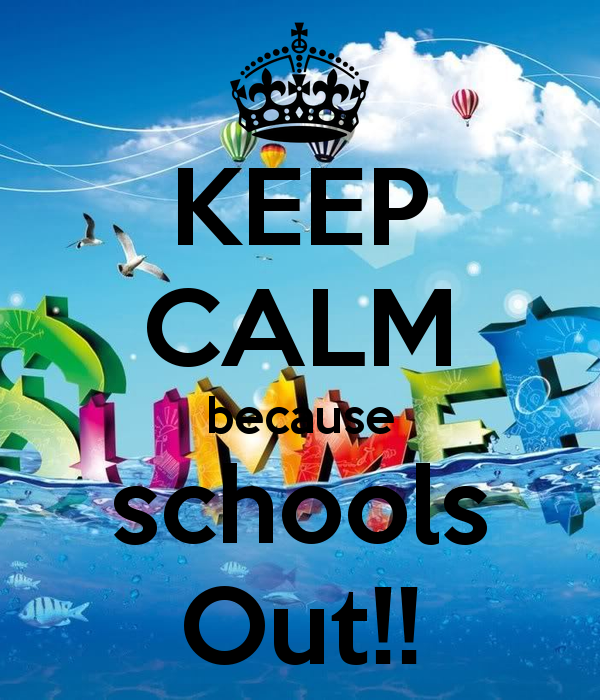 Take a good Summer Break until we meet again next academic year. Relax and enjoy Music as much as you can. See you next year! Images taken from Hanon Online, Andy's Words and Pictures, 123rf, Wikipedia (1, 2, 3), imgarcade, Hackea el Aula, O'Reilly, David Darling, David Wallace, Designinfographics, Metro, Tywi, Daily Mail, SoYouWanna, Steph Aaronson, Discard Studies, South by Sunset, Flickr, Kotaku, GagDonkey, QuieroDibujos, Rgbstock, Flute-a-bec, Bivem, En clave de música, IES Marqués de Santillana, Image and Art, Arte Creativo Total, Discapnet, Anonadatos, Ludoforum, Invited Life, Wikipedia, SmartArt Microsoft Office: Word 2007, blogtatuajes, forwallpaper, Earsinus,.Schollen Collection, Ancient Greek notation, Music of Yesterday, Wikipedia, Wikipedia, Smithsonian, Choirly, Wikipedia, OKNation, Medi-Music, Chmtl, All Music Sheet, White Hot, Moc, Mercado Libre, Learning Encounters, As Seen On The Internet, Valdosta, Lien Bui, Cosas sencillas, David Maestre, Britishkingdom's Blog, Sala de música, Unicentro, Coro Monumental de Guadalajara, La música es bella, Mediateca de EducaMadrid, RubyCliff, Christ Hind, Wikipedia, Music Zone,Guitar Forums, Euskomedia, Sengpielaudio, Redlands College, Laura Intravia, Memorising Music, Fluttery Records, Tickets Move Mag, Music Reading Savant, Learn Guitar for Free, Wiki 2, saxophone lessons,NEC, CEC, Cerl, Violin from scratch, Danza Edinba, Tirine, UTH, Greenwich Symphony, Stepher's Happening, Earth Cupcake, My Music Theory, Short and Sweet Music, Charanga, DANSR, ONU, LOC, Wind Loft, Top Rated Trumpets, Trevor Jones, Quakertown Cyberacademy, Cleveland, Musixcool, Cooper MSO, Mathematic SE, Philarmonia, Scott Brothers Duo, Potomac Academy, Devieant Art, Pulse Music, Slash's Paradise, Daily Mail, Ableton, Fremeaux, Trumpet Guild, Tommy Igoe, George Manstan, Tablao Cordobés, Zastavki, MyBioMedArt, Independent, Voer, Británnica Kids, Guardian, Flickr, Ultimate Classic Rock, Houston Symphony, Britannica, Virtual Sheet Music, Music Clear Center, imgkid, Lotus Music, Music Workshop, Kennedy Violins, Seattle String Studio, Net Places, Piano Guide, Personal Singing Guide, Quadibloc, Basic Music Theory, EveryNote, Piano play it, Paintings, Featurepics, Wikipedia, Cyberfret, Guitar Master Class, Piano Lessons Central, PQS, Designkultur, Hispasonic, wnyc, JHU, Tone Deaf Comics, Garage Band, Music Theory Academy, keepcalm-o-matic.